Have you ever been hiking and wondered, "Who made these trails?". Well the American Hiking Society has been "Saving Trails Since 1976" through Policy & Advocacy, Volunteerism & Stewardship, and Outreach & Education to the public. As an AHS Board Member, I have seen that many organizations and parks partner with the AHS so that hundreds of volunteers and trail workers can create and maintain hiking trails that we all can enjoy. A way you can help fund many of these programs and policies, is by joining in on the AHS #LoveofTrails T-Shirt Fundraising campaign which is open until February 18, 2017. 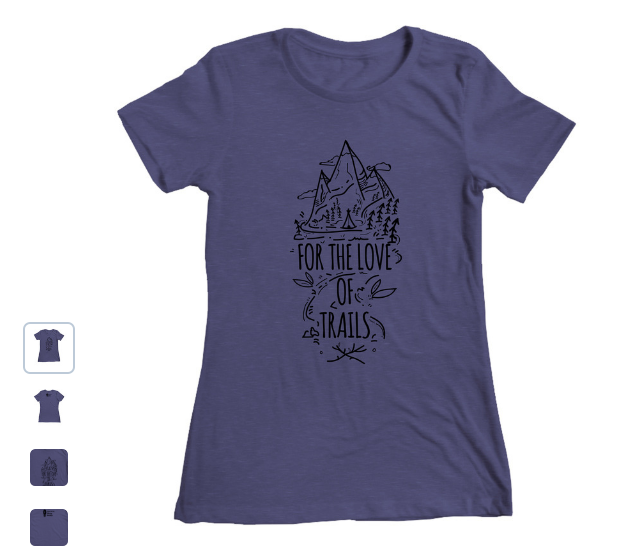 All proceeds go directly to protect places you love to hike! There are shirts for the whole family from kids to adults and sizes from XS to 3X's, and multiple colors to chose from. To purchase: Please visit "For the Love of Trails" Bonfire website. Every day thousands of miles of hiking trails are threatened. They are lost due to development, resource extraction, or closed due to lack of funding. Your favorite local trail today could become the latest housing development tomorrow. American Hiking Society is your voice on Capitol Hill. It is our goal to ensure Congress acts on legislation to protect our nation’s trails and the lands around them. This Valentine's Day, let them know you care. Show lawmakers that as a hiker, you expect and demand access to well-kept trails and public lands. Keep trails and parks open, wild, and accessible for your next outdoor adventure. Another way of supporting the American Hiking Society is becoming member! There is family membership option. Read more about membership on the American Hiking Society website.